Anker is a brand that needs no introduction at this point, but we’ll introduce it anyway. The company is known far and wide for making products that are just as good as anything from big-name brands like Samsung and Apple, but it doesn’t spend billions of dollars on marketing so it doesn’t have to work those expenses into its pricing. 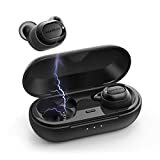 As a result, you get high-quality products like the Soundcore Liberty Lite Truly Wireless Earbuds by Anker at a fraction of the price of similar earbuds like Apple’s AirPods. That’s especially true if you pick up a pair today, because they’re on sale for just $44.99 instead of $60! 【Breathtaking sound】exceptional clarity delivered via grapheme drivers with deep, resonant bass. 【Smaller & lighter】incredible comfort and seamless sound that sits effortlessly in your ears. 【12-Hour playtime】3.5 hours’ playtime from a single charge and 9 extra hours in the compact charging case. 【Ultra-fast pairing】push and go technology simplifies the setup process so the last-paired Device automatically connects on startup. 【IPX5 protection】resists liquids for workouts in the sun or songs in the rain.